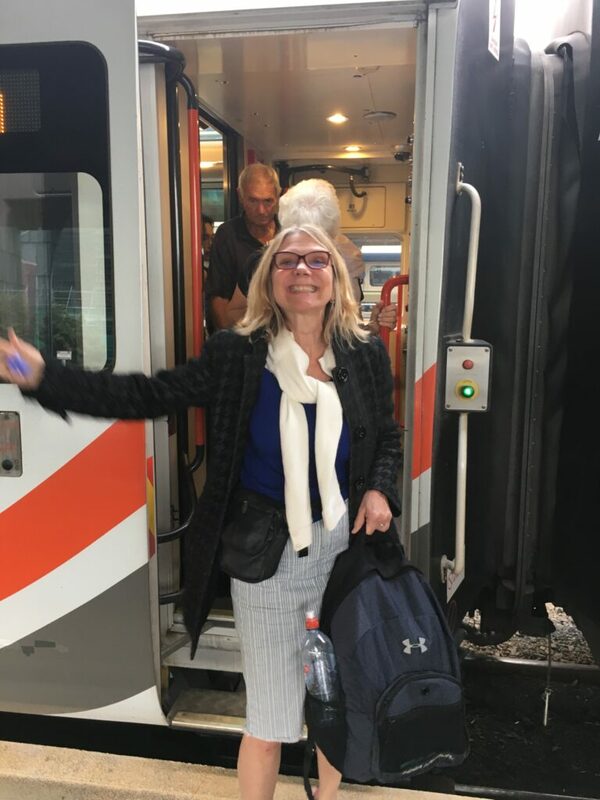 With most of the interviews done (5 general practitioners, 2 nurse practitioners, 4 nurses, 2 social workers, 2 caregivers and a team from the ministry of health) Lori and I pushed on further into the South Island. 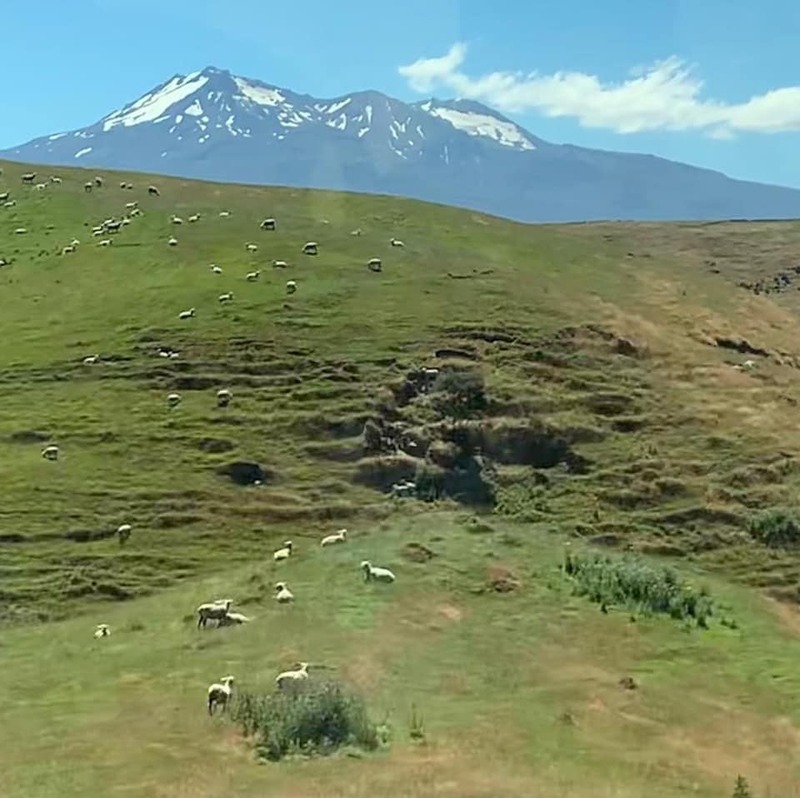 We took the TranzAlpine train from Christchurch to Greymouth through the Southern Alps. This was a 4.5 hour ride through mountains, valleys, across the Alpine fault line, past old mining and logging towns and finally into the temperate rainforest of Greymouth. Vegetation is THICK here with lots of palm trees and ferns. If you want to see an interesting depiction of life for 19thcentury Scottish settlers here – rent The Piano (1993) from Amazon. It’s a dark story of all the hardships that a “mail order bride” (Holly Hunter, Academy Award Winner) faced but the scenes of the Tasman Sea and the rainforest are spot on. This movie gives a hint to the hardiness of the modern-day Kiwi’s. From Greymouth we travelled up the coast by bus to the Pancake Rock or Punakaiki. A paved trail takes you to spectacular layers of stratified limestone that line the coast. 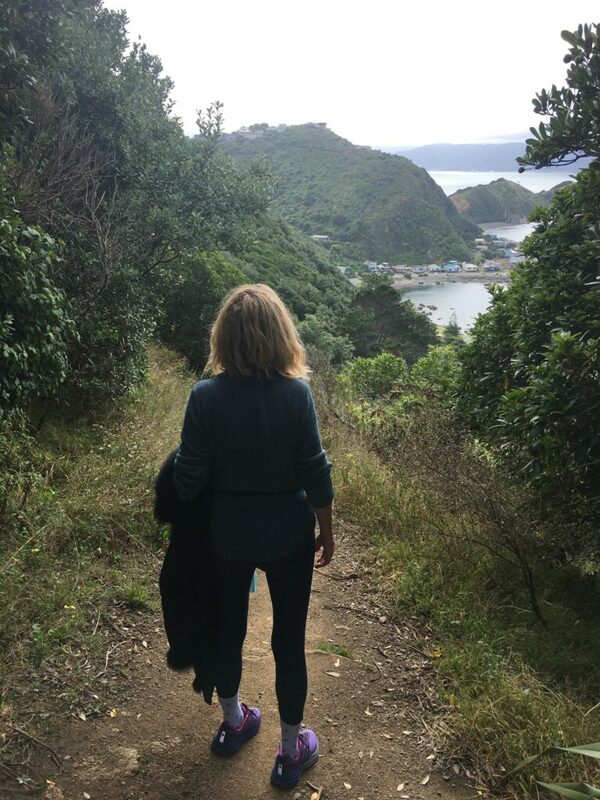 The attention paid to NZ’s natural treasures is impressive and well-maintained and signed trails make these special places very accessible. 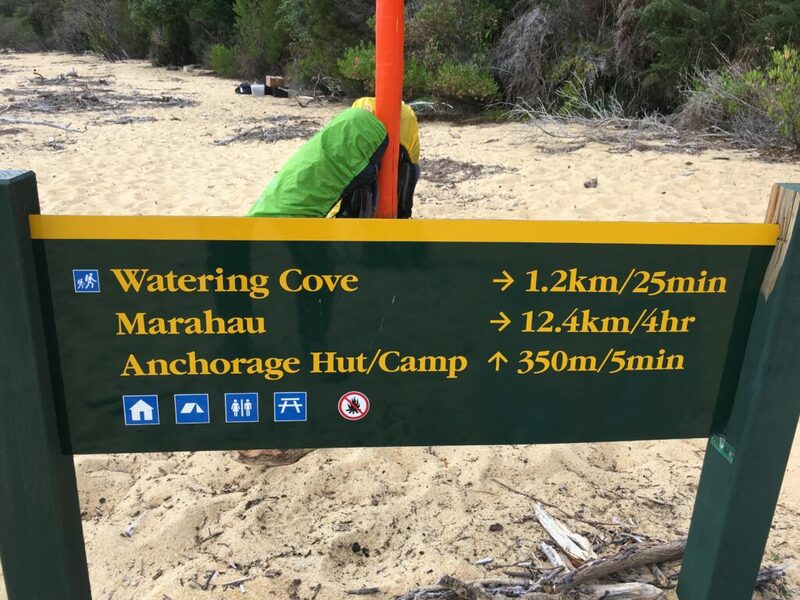 Another example of this is Abel Tasman National Park. 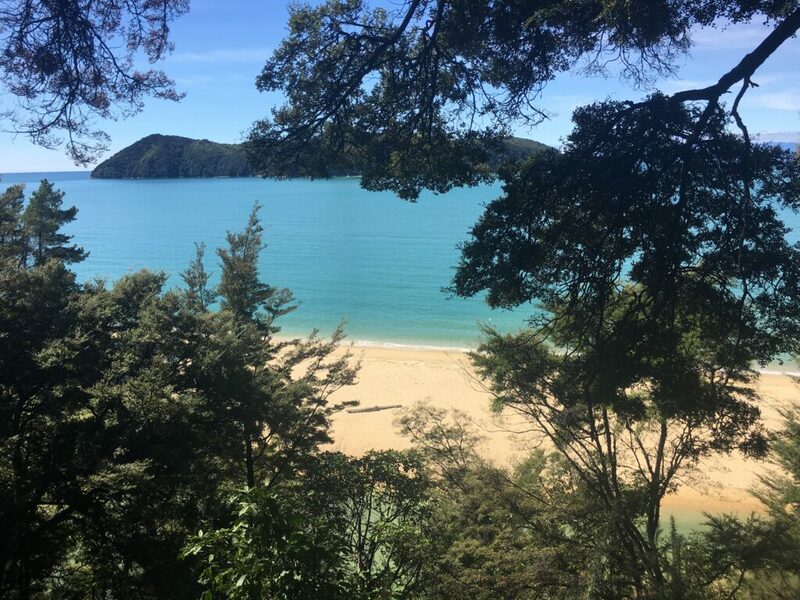 The Department of Conservation has created an impressive network of “tracks” with the Coastal track noted for some of NZ’s best scenery – golden beaches, clear blue water, and lovely vistas through thick bush. With kayaking, birding, hiking, biking, horseback riding, and boating options, this park is inviting all ages and abilities. I wish I could do further research regarding Kiwi’s love of the outdoors and being fit and active. Now I’m on a 3 hours ferry boat ride back to the North Island looking forward to one more week of work before my return to Vermont. 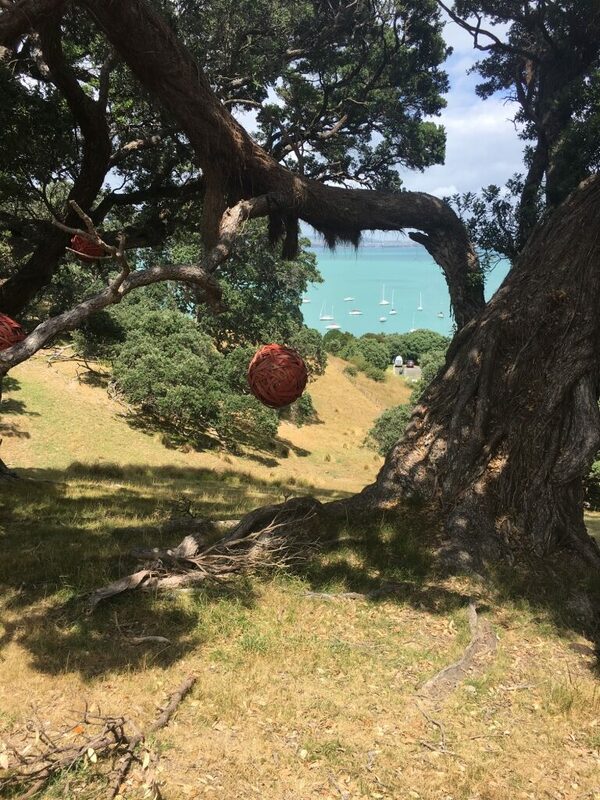 As memorials grew and grew in Christchurch, Lori (my Memory Center colleague) and I decided to get out into the country for the day. 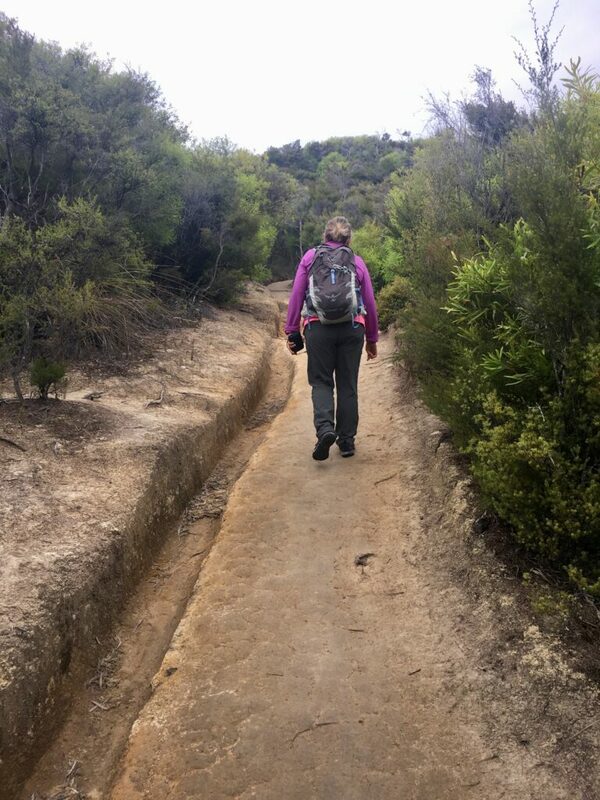 New Zealanders love hiking so well-marked and maintained “tracks” are available almost everywhere. 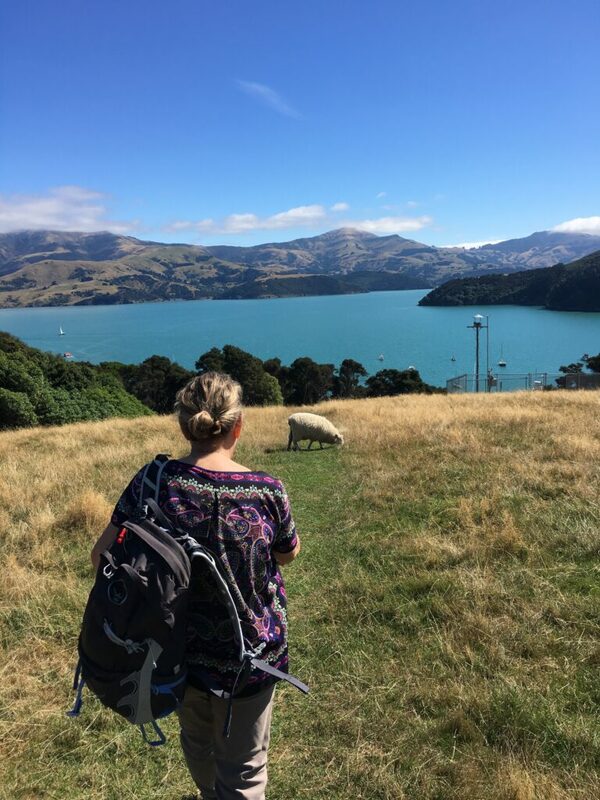 We headed for the Banks Peninsula and the village Akaroa on a bus from Christchurch (about 2 hours). The entire peninsula was created by a volcano and the winding journey over the highest peak down into the village is amazing. Once in Akaroa, we bought a map of the tracks that would take 3 hours or less and headed off. 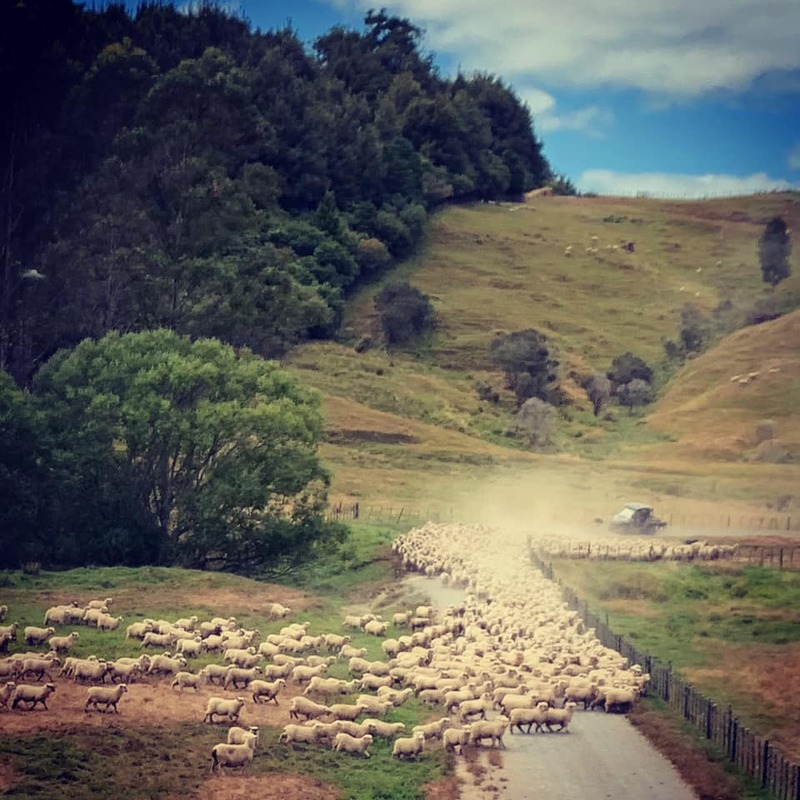 Climbing out of town toward the Akaroa bush reserves via quiet back streets and dirt trails, we were quickly by ourselves despite the crush of people debarking a very large cruise ship at the town’s wharf. As we walked past a beautiful home, we were greeted by a woman coming out of her driveway to take her dogs for a walk. 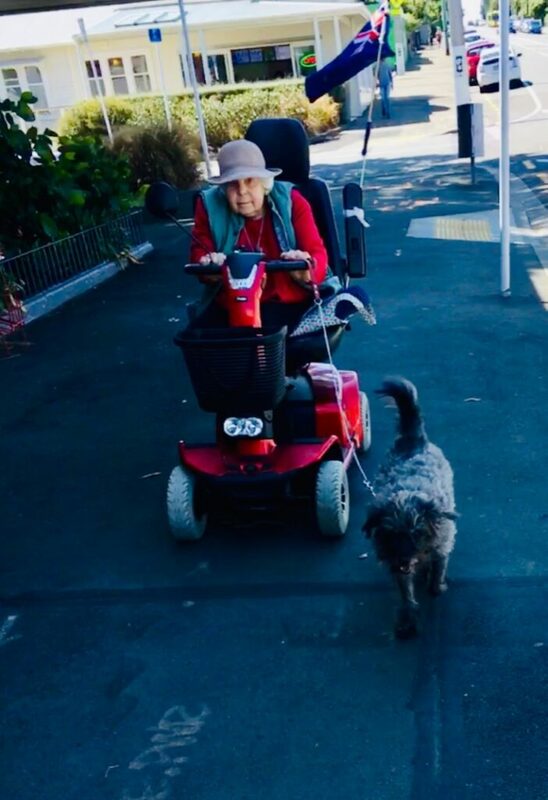 She asked if we were out for a walk and we answered with a compliment of her lovely village and an expression of sorrow for New Zealanders about the recent shooting. At that point, she invited us in to see her gardens. 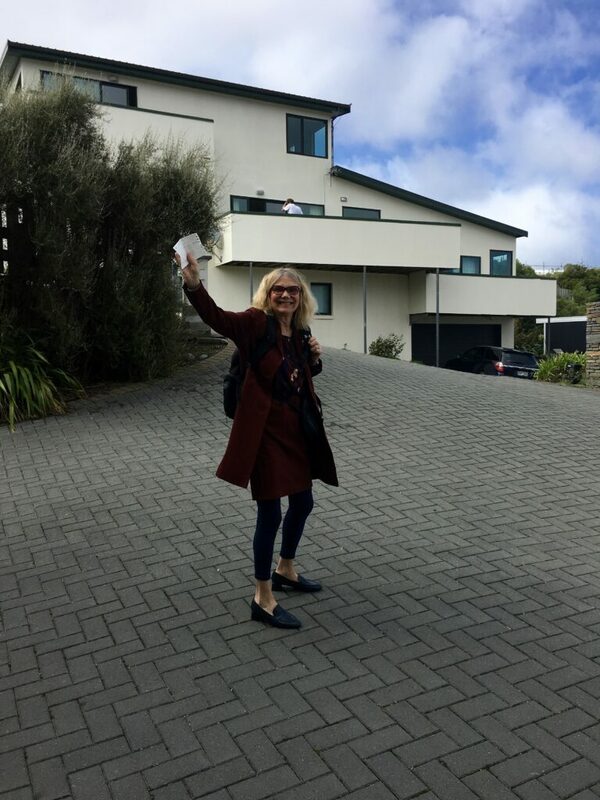 Her house was previously the home of a French consulate who requested to retire to Akaroa after her service was done. 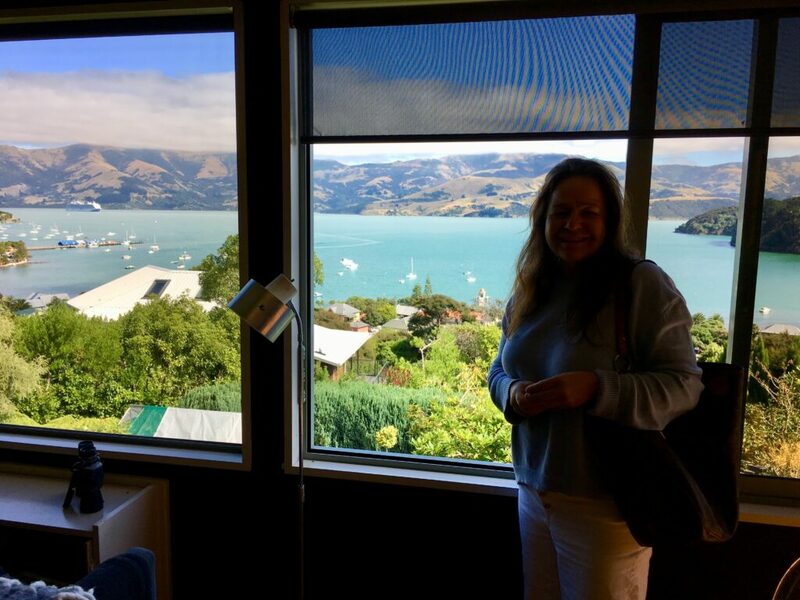 Jacqui and her husband were able to purchase this incredible place which had extensive gardens and an amazing view of the Akaroa Harbor. It was definitely one of the most beautiful homes I have ever been in. 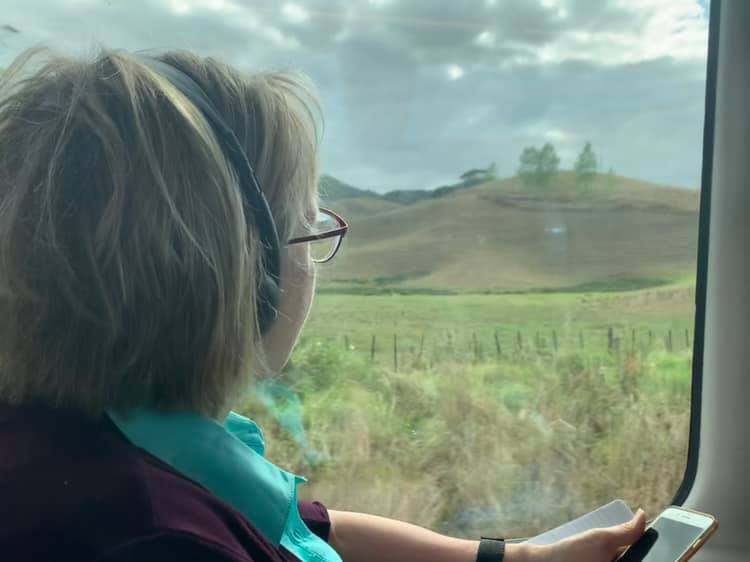 When we explained our research to Jacqui she was kind enough to share her recent caregiving experience and give us even more insight into dementia care in NZ. What a lovely lady, we are so thankful for her invitation into her home and her life. This chance encounter provided us with another unique voice of a New Zealand family carer. 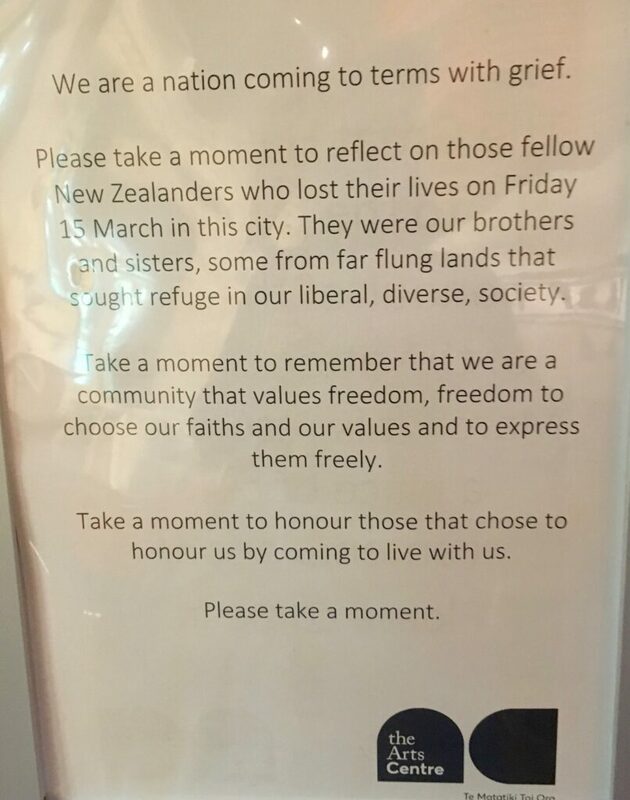 As circumstances would have it, Lori McKenna, my brother, Julian High and I were due to fly to Christchurch on Saturday, one day after 50 Muslims were murdered while they prayed in their mosque in that city. On Friday, the news broke slowly: 4 shooters, then 1, school kids in locked in their schools until 6PM, and many businesses shuttered. Our first reaction to stay away was based on our previous experience of “lock down” and how it paralyzes normal life in a city. 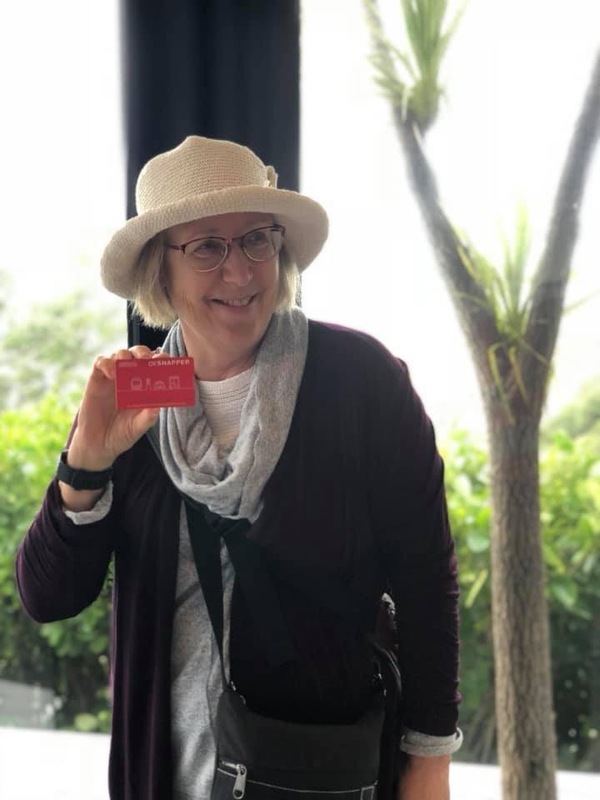 The next day, our 1:30 PM flight to Christchurch was cancelled; however, we were all automatically rebooked on an earlier flight leaving at noon. Despite our uncertainly, sorrow and a little bit of fear we decided to go. I’m fortunate to have two wonderful colleagues to help me with this research project. The first to arrive was Betty Rambur PhD, RN, FAAN who is the Routhier Endowed Chair Practice and Professor at University of Rhode Island. Betty has been my research mentor on workforce issues since 2001 and we work well together. 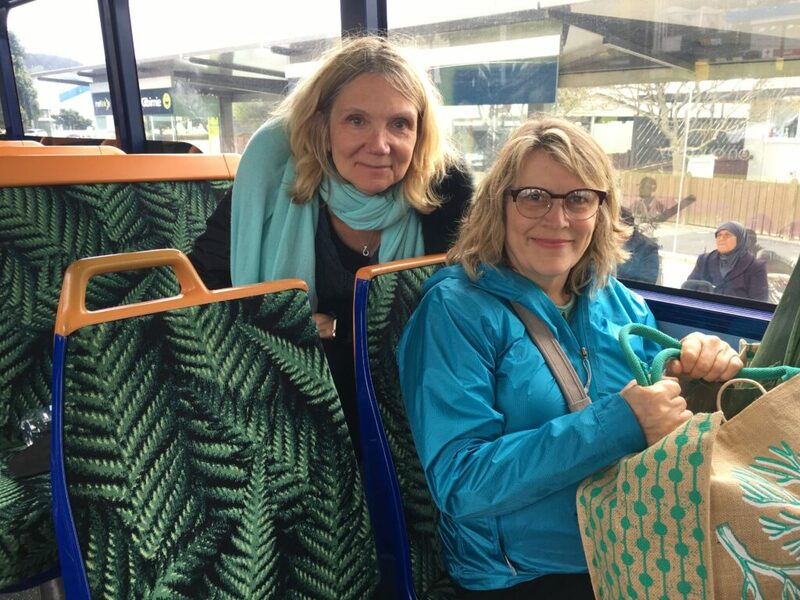 She hit the ground running in Auckland and met two engaging older women with personal and professional experience in dementia care. One in particular has authored the two books pictured below. 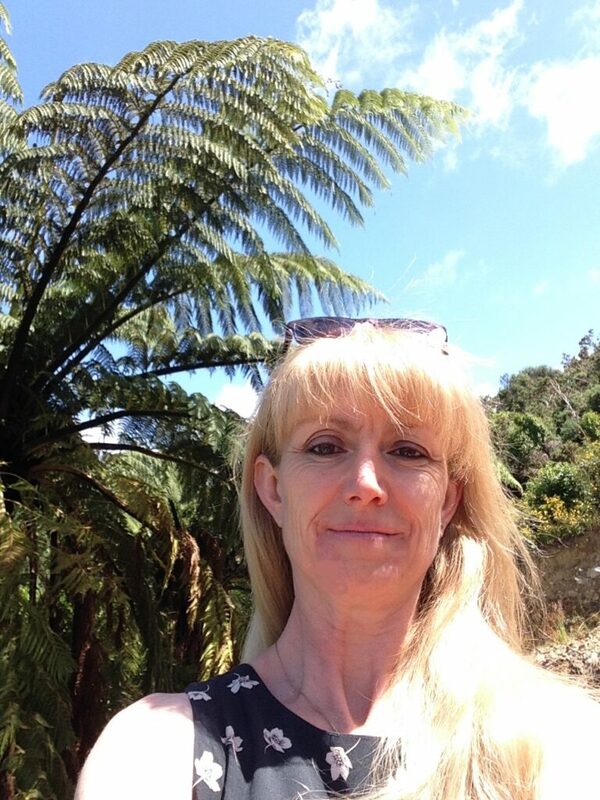 She will explore health policy and financing of dementia care in New Zealand. 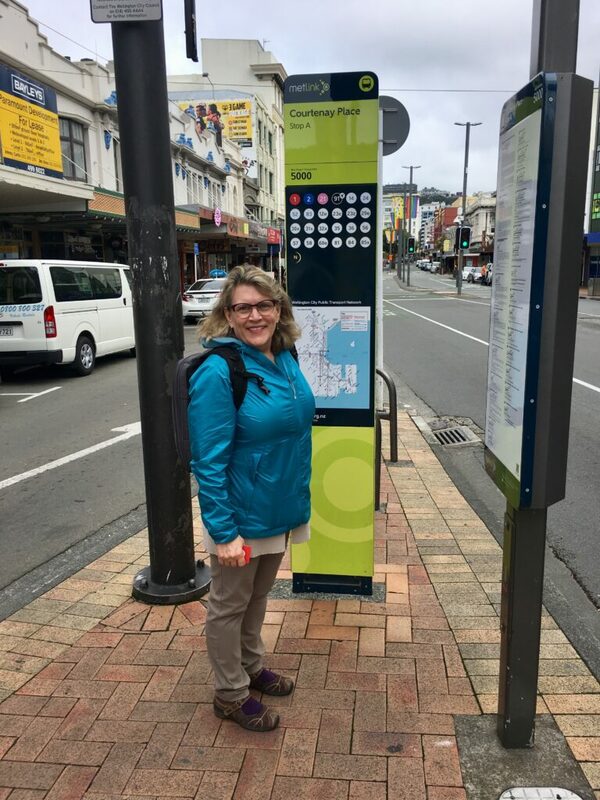 Once in Wellington, Betty and I had an orientation day of busing around, New Zealand lawmaking (included a tour of the “Beehive”), and an Ethnic Food Fair at the local school with Indian, German, Hangi, Chinese, Mexican, Cambodian, African, Middle Eastern, Pacific Island, Somali and Greek dishes. This gives you a good idea of the diversity in Wellington; I wish I could share the tasty treats! 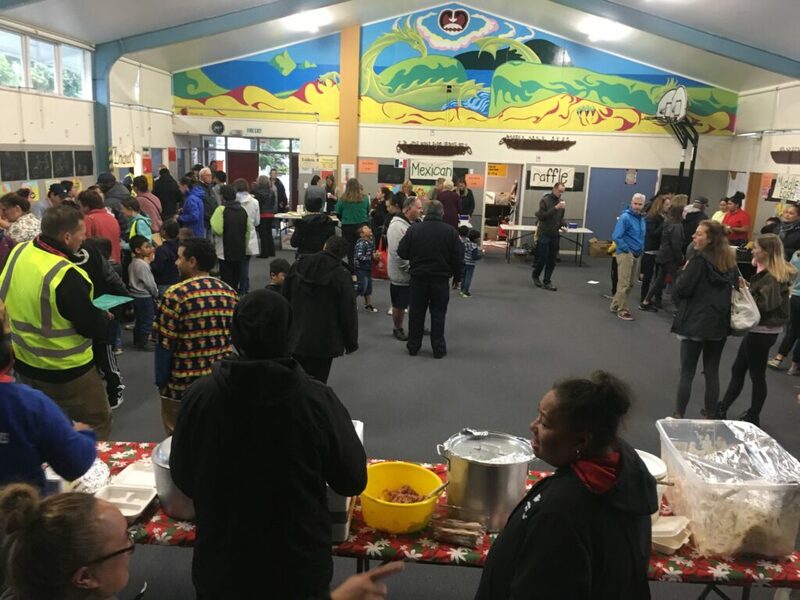 Ethnic Food Festival at the Miramar School… Yum! 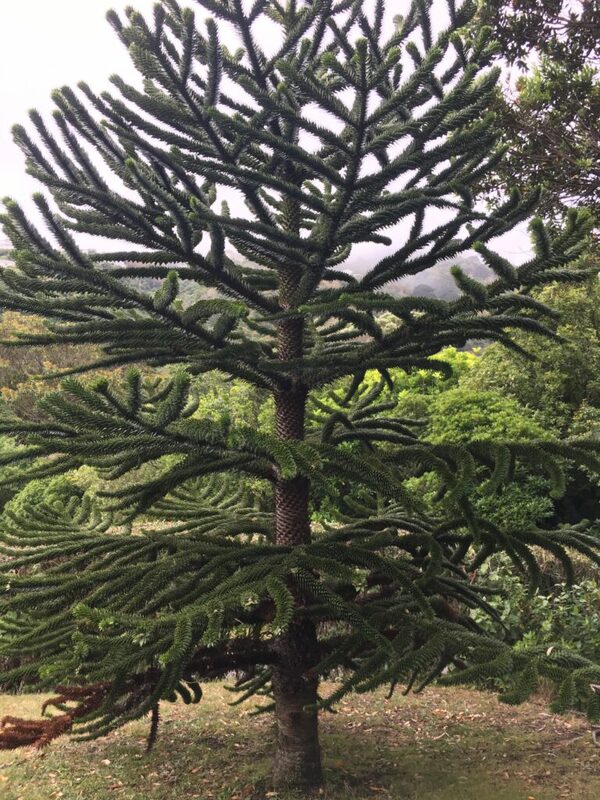 Now that I have visited and contacted 16 primary care offices in Wellington NZ, I would like to offer this observation…. 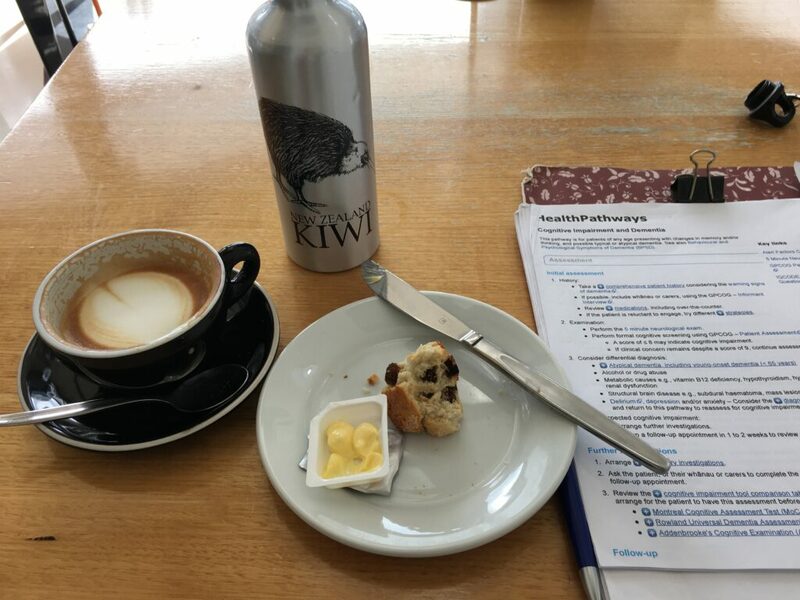 New Zealand really knows how to use nurses in primary care! In each office the Nurse Consulting Room is up front close to the waiting room. I was lucky enough to snaps some photos to give you an idea of this space. The nurses’ role in chronic disease management allows the GP to focus on the medical care and adds to the holistic health of the patient and family in their home setting. I wish I could bottle up this model and bring it to Vermont. My wellness activity for today… a nice swim in one of the many pools in Wellington. Did you know that all children are required to learn how to swim in grade school here? A smart idea for this beautiful island nation; the investment in their swimming pools is evident everywhere. Happy me! Today I went farther that I have to date guided by my trusty Google Maps ap. 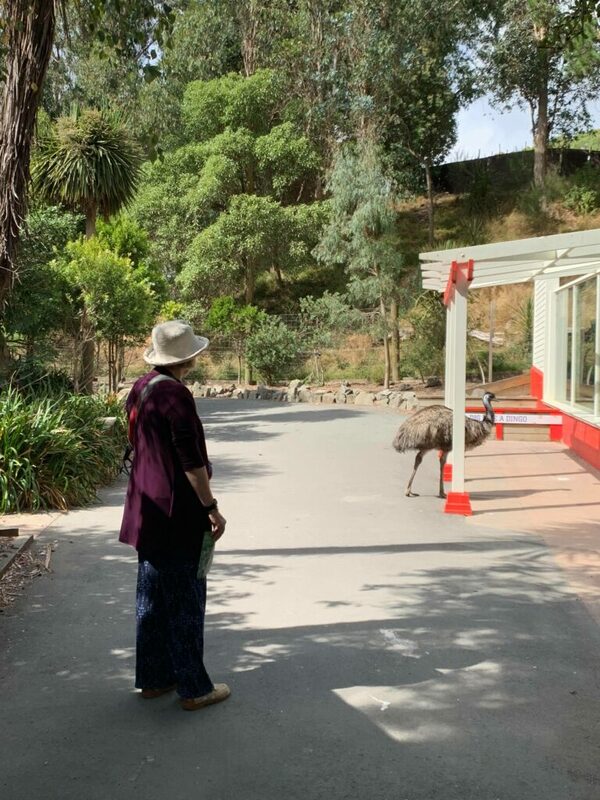 The destination was Johnsonville which is on the northwest side of Wellington, past Khandallah and my favorite name: Kaiwharawhara. Being a little phonics challenged, I’m appreciative when the syllables repeat themselves. 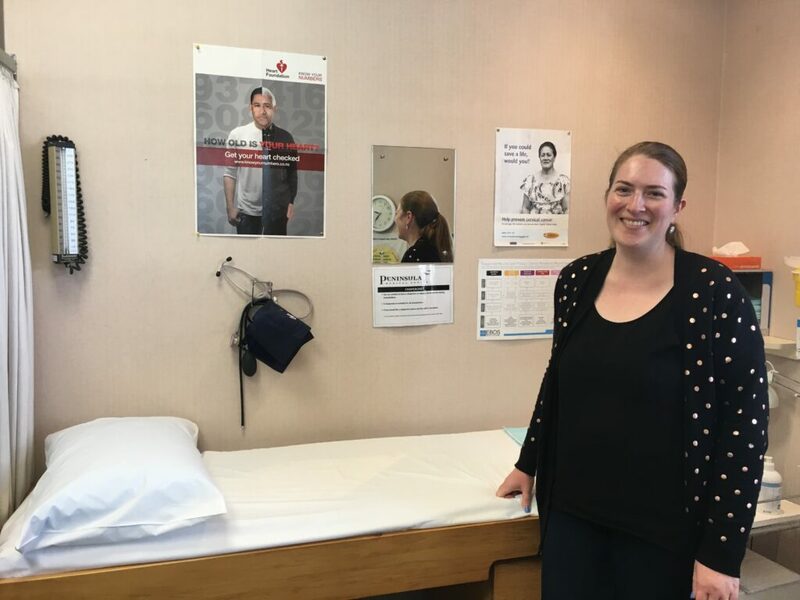 Here are a couple of things that I have noticed from my time in waiting rooms: No one wears white coats, the GPs “room” there own patients and the nurse consultation rooms are usually right off the waiting room. The best thing about my bus ride today was the second practice that I visited was on the other end of the #1 bus route. A 51 minute straight shot to a lovely little beach neighborhood. Bonus – it was a double decker bus. 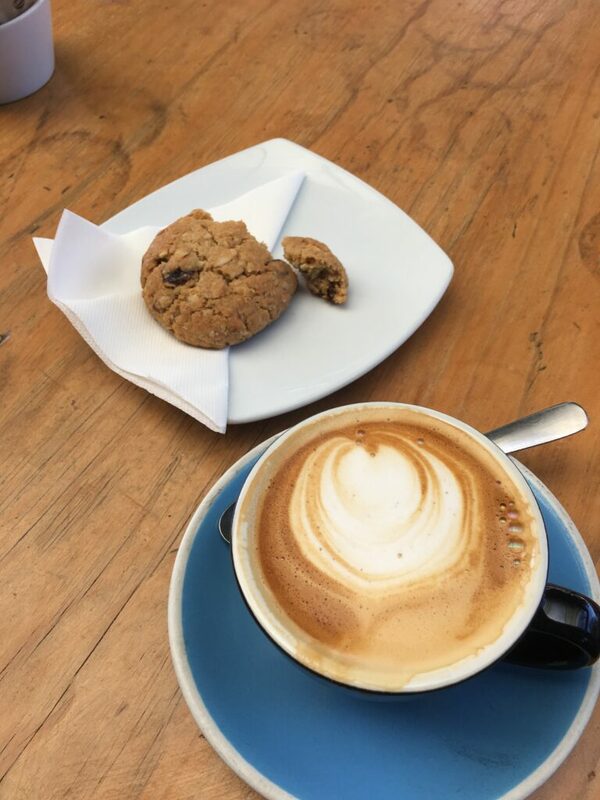 Of course I had a picnic lunch and then my snack treat – a flat white and Anzac biscuit. During my snack break, I watched a procession of school kids heading for the beach with their hats and towels and teachers. It seems a bit chilly to me but there they go. I’m starting to love my routine here. 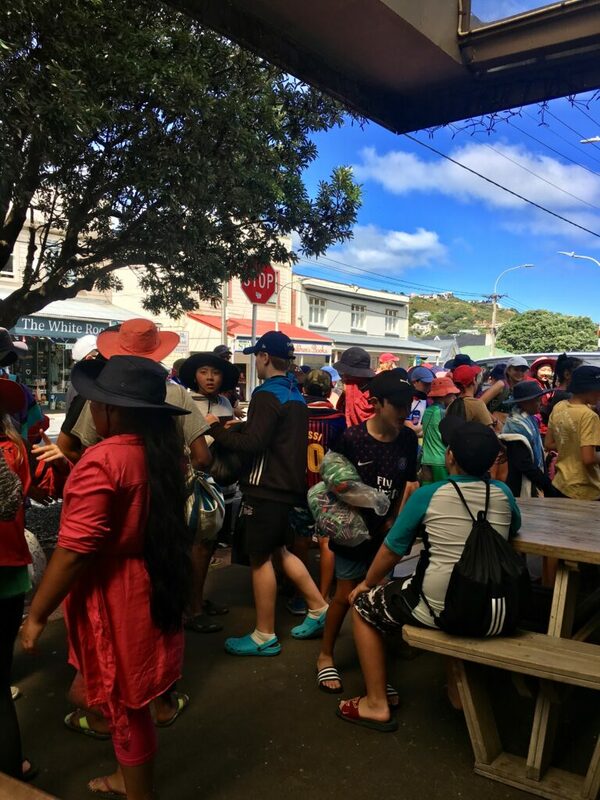 School kids heading for the beach – all have hats on and it’s about 65 degrees! A flat white and an Anzac biscuit while watching the school kids past by to go to the beach. 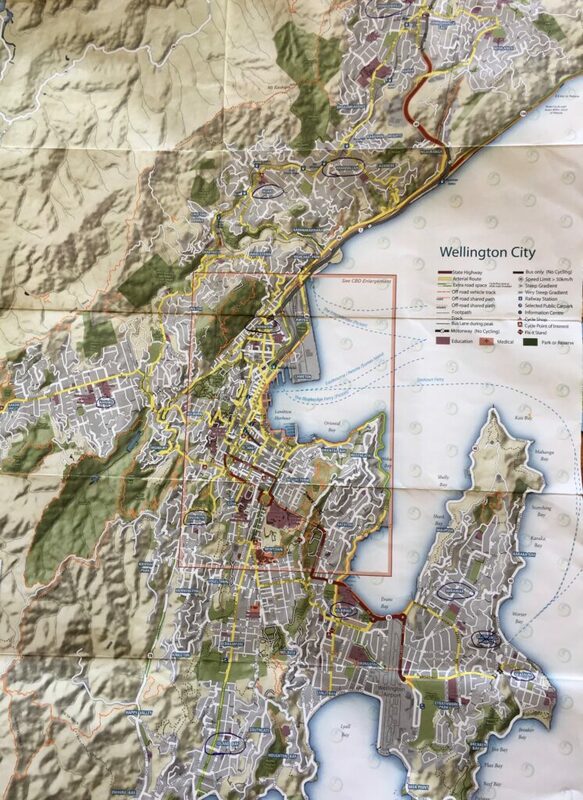 Wellington New Zealand is an interesting collection of neighborhoods nestled into a hilly topography connected by bays and tunnels in some places. The weather has been great for walking but I’m considering getting a new haircut that will look good no matter which way the wind blows. “Windy Welly” has been appropriately named. A sturdy hat or the perfect haircut is necessary to avoid looking like my dog with his head out the car window when I introduce myself at a each new practice. Nevertheless, I have made my introduction at 13 primary care offices. Some were follow ups to letters, emails and postcards that I had sent. 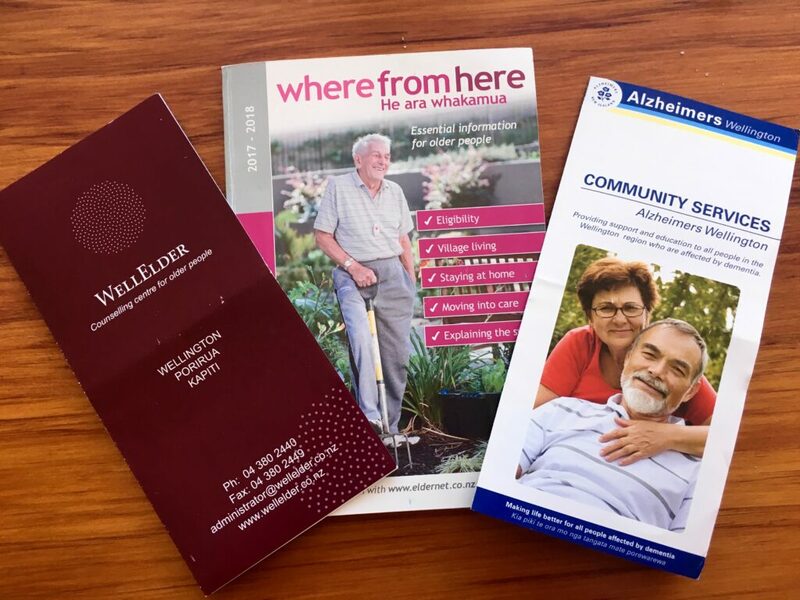 Most visits involve a brief introduction, handing over the research information sheet, and a request for the GPs or nurses to be interviewed about dementia care. Most practices have Practice Managers that can be very helpful saying for example “my dad and grandfather have dementia”; or can be strict gatekeepers of access to the providers. I love when I get invited into a nurse’s consultation room. 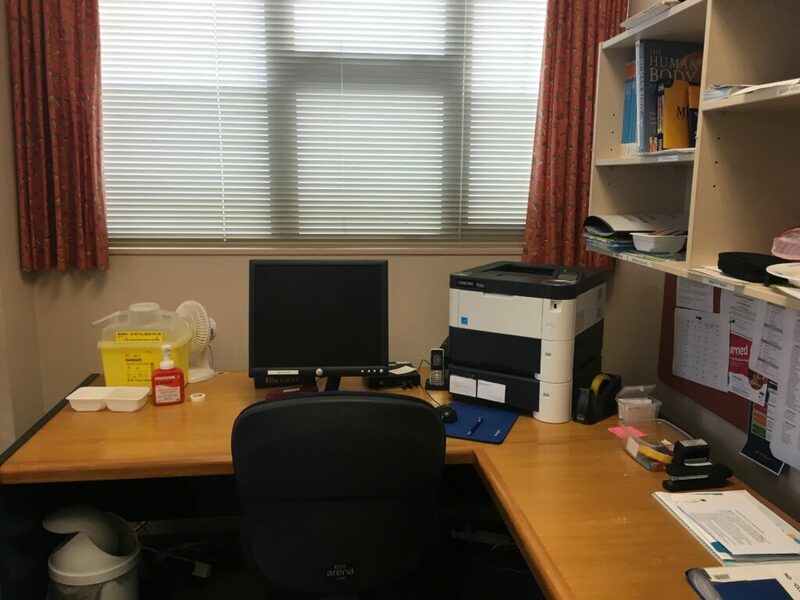 These are usually a well set-up exam rooms with a computer and telephone included in this work space. I promise I will take some pictures. The nurses I have met have a big help in securing an interview with a GP, often recommending the best one in their practice. 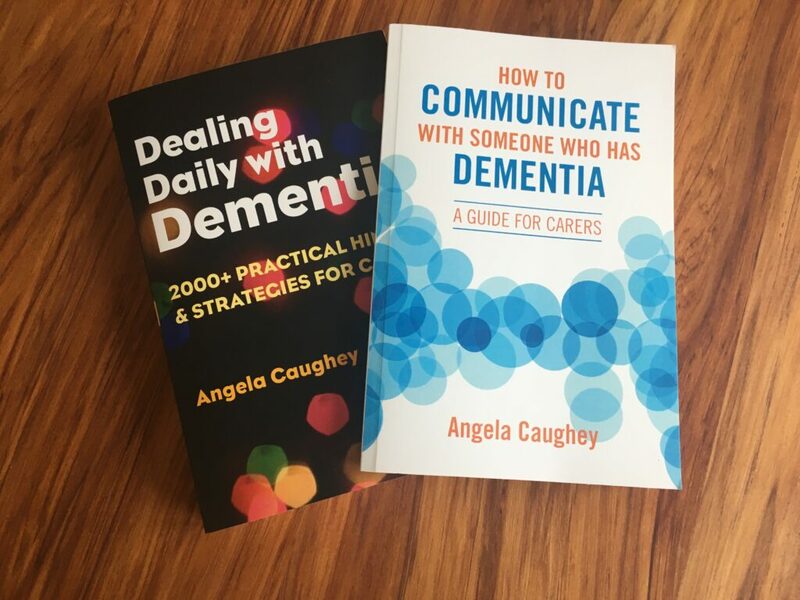 I have done 2 interviews so far which have confirmed that I came to the right place to study different models of Alzheimer’s care. I have 2 more interviews on my schedule and at least 5 more new practices to visit before circling back to the ones that I have already contacted. It’s exciting work for me and each new waiting room helps me understand New Zealand’s health care system a little better. I have visited 5 practices in the last 2 days and had 13,000 steps on my Fitbit by 1PM today. 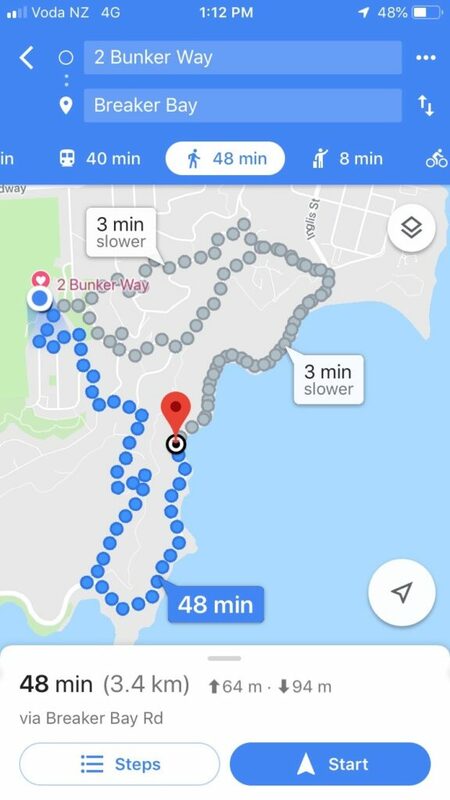 It helps that I walked the wrong way 3 out of 3 times while trying to follow my Google Maps directions. Sometimes I think I should have a compass around my neck and a paper map in my hand. Seriously, the Google Maps ap is great and it helps me know when to “tag out” with my Snapper card and hop off the bus (see picture below). The bus rides are very interesting and I try to observe at least one new thing on each bus ride. Today I happened into a Korean neighbor and enjoyed waiting for the bus with a few Korean elders. Most people (young and old) say “Thank you Driver” as they get off the bus – what a nice custom. I am making progress with scheduling interviews – 3 are lined up and I’m hoping for many more. When a practice manager said “We are keen to help” it was Kiwi music to my ears! My wellness activities for the last two days have been – a great 3000 meter swim with my pal Cynthia and 6:30 AM yoga in the most beautiful yoga studio I have ever been in. ONWARD! Another interesting Kiwi elder, she was flying the flag! An invitation to an interprofessional discussion, with a visiting geriatrician at a GP office, gave me my first BIG idea of the trip. What if… telehealth consultation by dementia experts was available to all Vermont primary care practices on a rotating basis regarding diagnosis and management of people with dementia and their families? That might help! Thank you to the nurse manager to invited me to the interprofessional conference with their new district geriatrician. This nurse manager finds interprofessional brainstorming VERY helpful; always a good sign. Today’s wellness activity: a long walk on the beach at Seatoun after visiting my 3rdprimary care practice today. 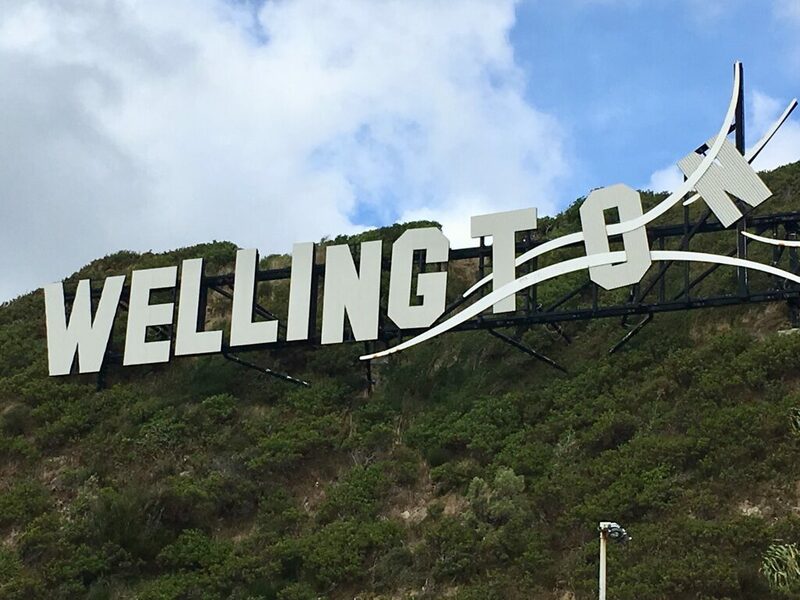 The wind in Wellington is very strong and a firm hat and substantial jacket make beach walking very fun. Here is a picture from the Seatoun Beach and the Oruaiti Reserve. Unfortunately, no blue penguins were around but, I had already met them at the zoo. 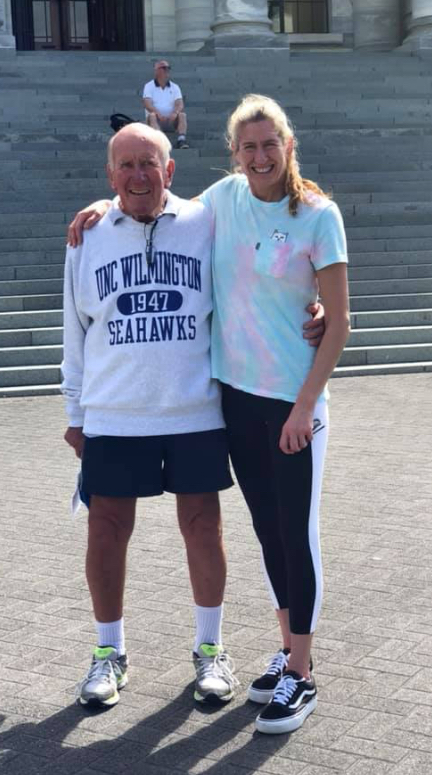 Charlotte Brynn and her father Don. I got to meet my second Kiwi octogenarian; what a wonderful man Don is. He told me a little story to illustrate how well he thinks elders are cared for in New Zealand. His brother is 94 years old and received home health services because he lived alone until recently. Don explained that one person would come in the AM and put his bedding into the wash, the next person would come and hang his sheets out to dry, and third person would come later that day to take down the sheets and make his bed. Don felt that it was all seamlessly coordinated. What a great idea to spread care throughout the day and give more opportunities for conversation. I have included a picture of Don and his daughter, a healthy and active family for sure. So far, I have visited 3 primary care practices and have about 20 on my list. I have also learned that the “navigators” referred to in the NZ Framework for Dementia Care are social workers who are district based. I hope to meet some soon. The primary care or “GP” offices seemed to be in each neighborhood in Wellington. 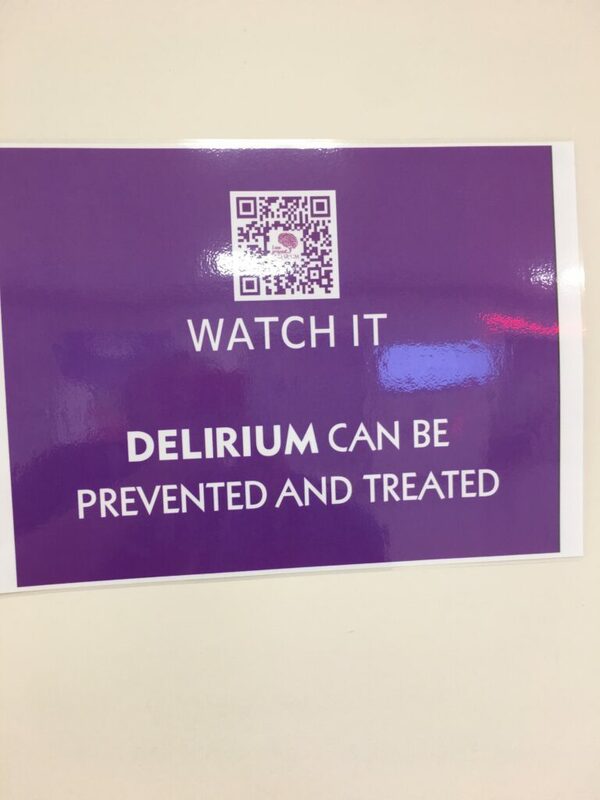 Staff are friendly and the waiting rooms are full of health information. Although New Zealand has a universal healthcare system, there are fees associated with each visit. Nurse visits have been available in all the offices that I have visited so far. Can’t wait to learn more about that. I did note on one practice’s website that the nurse’s bio included “smear collector.” I’ll let you ponder that one. What a way to see the North Island! The train ride was comfy and the scenery was stunning. 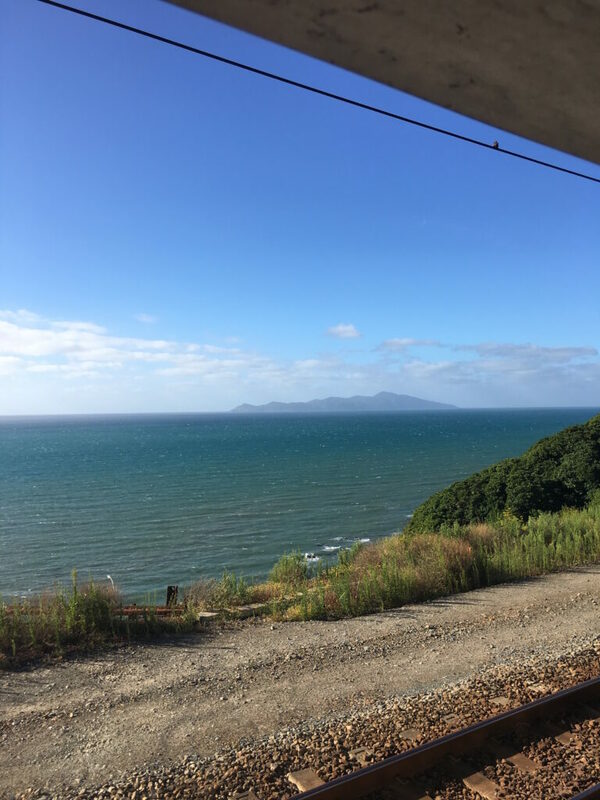 Here is link to the route of the train which gives a good description of each region that I traveled through https://www.greatjourneysofnz.co.nz/northern-explorer/. There is a series of 5 viaducts over which the train goes very slowly and you can stand outside in the observation car for some great pictures. Headphones are provided for a description of what you are seeing along the way. It was a great introduction to how the geography of this beautiful land has shaped it’s people and commerce. Lastly come the views of the Cook Strait and glimpses of the Southern Island. No WIFI, so bring a good book or download your work before booking. 2/17 Auckland is surrounded by some beautiful islands and volcanic preserves that are easily accessible by ferry. 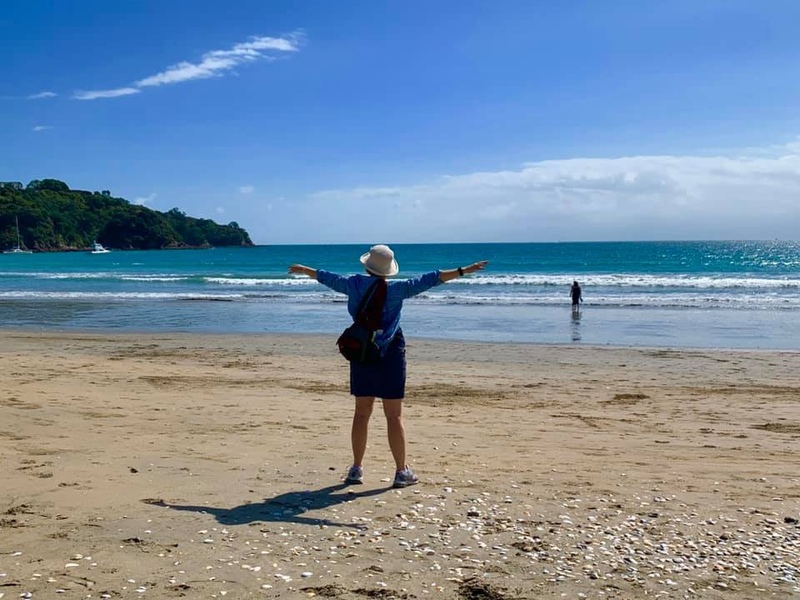 So we headed out early for a full day of exploring Waiheke Island. 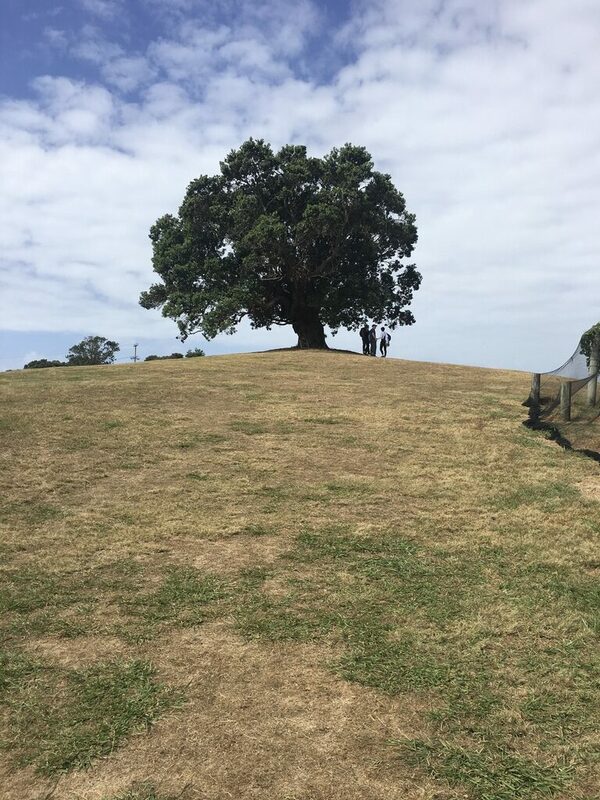 The island is filled with rolling hills topped by beautiful ancient trees. The bus can take you all over the island and the drivers are friendly and helpful. First we stopped at the beach at Oneroa Bay which gave us a good initial stretch of our legs and plenty of shells to examine. 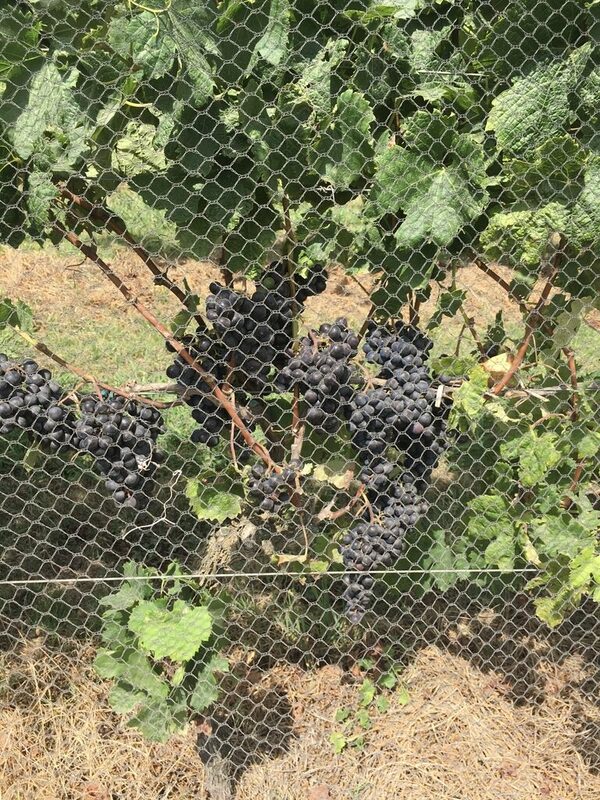 We were able to get some good hikes in between the 3 wineries that we visited – Kennedy Point Vineyard, Goldie Wines, and Stonyridge Vineyard. All had long driveways to inviting outdoor tasting areas with beautiful visas of vineyards and the ocean. Lindsay and I walked about 9 miles and were happy not be to delivered place to place by van, taxi or helicopter. A great introduction to lovely New Zealand wine and landscape. 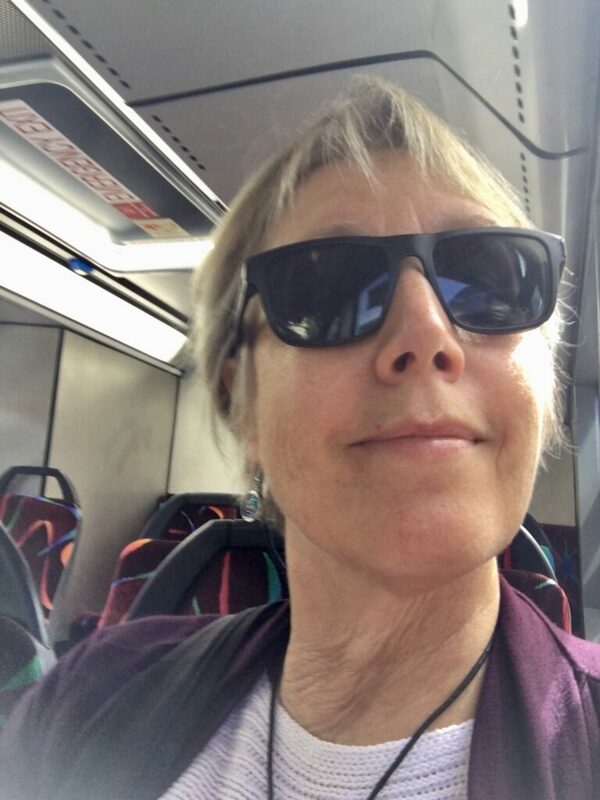 On the bus back to the ferry, I had my first interview with an New Zealand octogenarian. 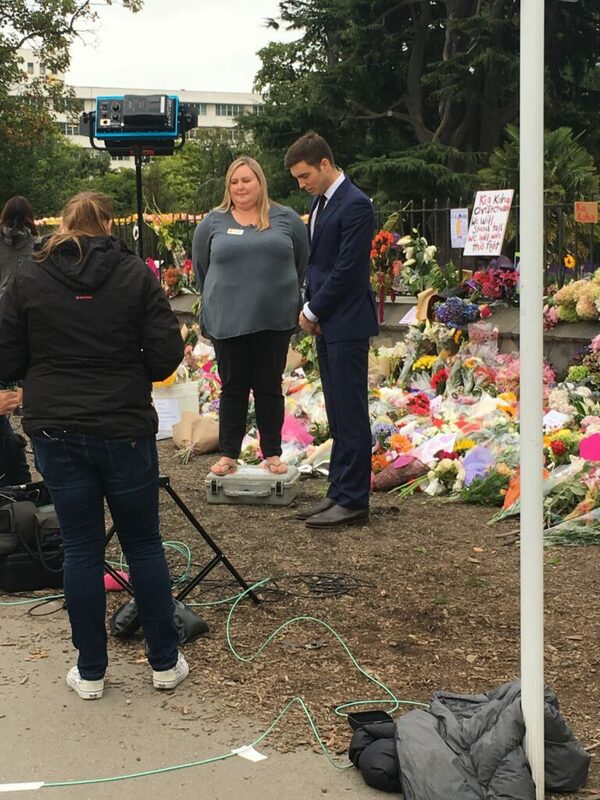 He felt very supported by the NZ health care system. His only complaint was sometimes a wait for non- urgent surgeries, but he reported that he was quickly seen for a cardiac event with extensive workup and treatment. He noted a physician shortage in his rural area but feel well taken care of by the nurses that were involved in all of his primary care visits. 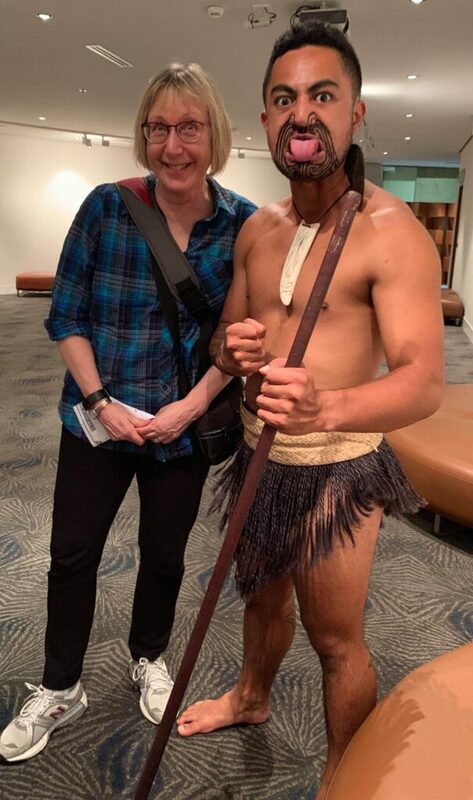 Our 2 days in Auckland acclimating to New Zealand were delightful and now we are ready to move on and set up the homebase for the research project in Wellington.